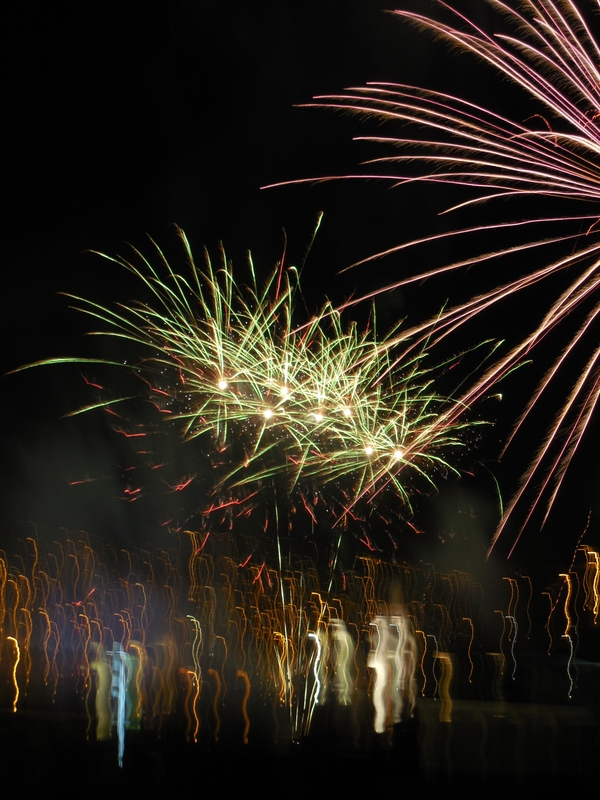 On 10 August, fireworks explode across the sky of the very heart of Quito, Ecuador. It is Independence Day in this Andean nation. On this date in 1809, Quito (Ecuador) declared its independence from Spain. This is considered to be the “First Cry of Independence” (Primer Grito de Independencia) and earns Quito the nickname “Light of America” (Luz de América). Quito was the first Latin American city in which the CRIOLLO population declared independence from Spain. Criollo – descendents of the Spanish conquerors, and who possessed the economic reins of local communities. Now they wanted the political power. But they were not the first to declare independence from Spain, not by a long shot. From the moment the Spanish conquistadores stepped foot on the America continent, the local indigenous nations rose up against these invaders. Even in Ecuador, from the very moment that the Spaniards began sweeping through the Inca Empire after murdering Atahualpa in 1534, the Inca generals resisted. The most famous of these was Rumiñahui of Quito. For centuries before the First Cry of Independence in 1809, the indigenous nations rose up against Spanish dominance. From strongholds in liberated territory deep in the mountains, deep in the jungles and mangroves, they fought the foreign occupation of their ancestral lands. Lempira in Honduras, Nicarao and Diriangén in Nicaragua, Tupac Amaru in Peru. There was one nation, though, the Spaniards could never conquer: the Mapuche of the Chilean and Argentine Patagonia. And it was not only the native peoples who again and again declared their independence from Spain and their Criollo agents. Africans, enslaved and dragged to these foreign shores, also fought for independence. Groups escaped to found palenques, or settlements, deep in the mountains, the jungles and mangroves. They attacked the Spaniards, attempting like their indigenous brethren, to be free. In Episode 4 of his series, Black in Latin America, US scholar Henry Louis Gates, Jr., examines the history of African peoples in Mexico and Peru. He visits the village of Yanga, a palenque located an hour inland from Veracruz, Mexico. This is considered to be the first free African town in the Americas. In 1570, Yanga and other Africans escaped slavery and founded this town. For 30 years, they hid in the mountains and attacked the Spanish. Finally, in 1609, the Iberians capitulated and signed a treaty recognizing this Free African settlement. Other communities also proclaimed their freedom: Tumaco, on the Pacific coast of southern Colombia, revolted against Spanish rule in 1781. Up on the Caribbean coast of the same country, not too far from Cartagena, San Basilio de Palenque was an important center of continual resistance against the Spaniards since the town’s founding in the late-16th century. And Ecuador as well saw its free, independent African nation in the mangroves of the Pacific Coast. According to Black History Heroes, the story begins with a shipwreck in 1553. By 1590, the República de Zambos stretched from Manabí Province in Ecuador all the way north to Barbacoas in modern-day Colombia. Spanish pacification of that kingdom, however, proved to be short-lived, and the Esmeraldeños again declared and fought for their independence from Spain. So – Was that cry in Quito on 10 August 1809, in truth, the “First Cry of Independence” in the Americas? 10 August 1809, Quito (Ecuador) declared its independence from Spain. This is considered to be the “First Cry of Independence” (Primer Grito de Independencia) and earns Quito the nickname “Light of America” (Luz de América). “Say what?” our faces cry as we listen to him weave the history of his hometown. We’re sitting in his sister’s café just a few blocks from Quito’s Plaza Grande. In fact, this building where the café is was the home of one of those próceres of independence, Antonio Ante. Don Marco explains to us: It wasn’t Spain who controlled the reins of power here. Spain had been conquered by Napoleon Bonaparte who appointed his brother to occupy the throne. The próceres’ declaration was to resist Bonaparte’s illegitimate “Spanish” king and his illegal representatives in Quito. Is this true? I decide to do a bit of research. The current state of uncertainty that has engulfed the Spain, the annihilation total of all legally constituted authorities, and the dangers to which are exposed the person and possessions of our beloved Fernando VII of falling under the power of the tyrant of Europe, have given to our brothers of the presidency to form provisional governments for their personal safety, to escape the machinations of some of his perfidious unworthy compatriots Spanish name, and to defend the common enemy. The loyal inhabitants of Quito, imitating his example and determined to keep to his rightful king and sovereign lord this part of his kingdom also established a Sovereign Board in this city of San Francisco de Quito, in whose name and by order of His Excellency the President, I have the honor to communicate to you that the members of the former Government have their ceased functions. …. With Napoleon’s conquests in Europe, Spain’s colonies became de facto French colonies. This provoked some Criollos to rebel against the (new) authorities. In other areas of America, rebels took the opportunity of crown’s weakened political control to seek definitive independence from Spain. The revolutionary movement would be bloodily crushed by royal forces (still controlled by the French usurpers) less than a year later, on 2 August 1810. With Napoleonic Spain’s reconquest of its rebel city, the organizers were imprisoned. A daring rescue attempt, then a “witch hunt” of the revolutionaries ensued, resulting in the deaths of 1% of the city’s population. Quito’s independence was definitively won with Mariscal Antonio José de Sucre’s victory at the Battle of Pichincha on 24 May 1822. 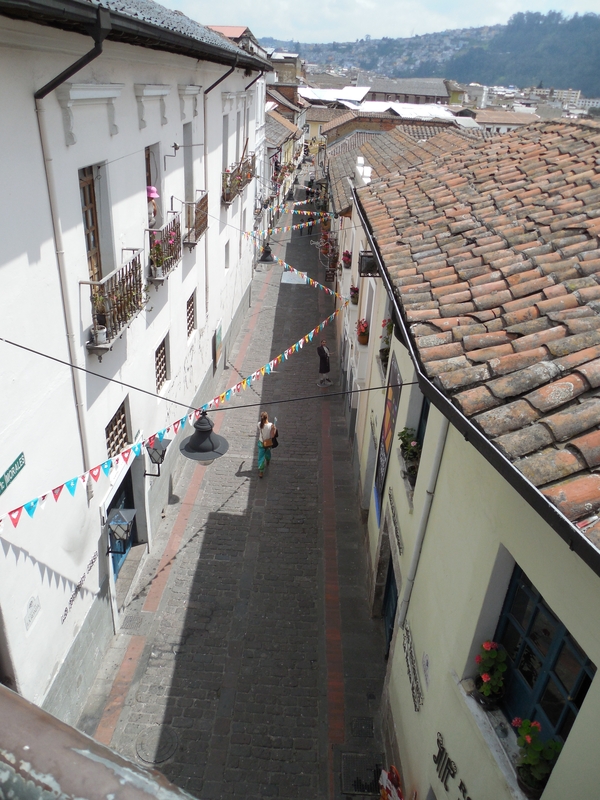 On Independence Day eve, you can join in a Recorrido de la Velada Libertaria, with theater music and other events, through the narrow streets of the colonial neighborhoods of Quito. The program shows a map of the walking tour (on page 34). And of course, fireworks will top off the evening. Let’s take a photographic tour of Quito, to some of the sites associated with this momentous event, the Primer Grito de Independencia. 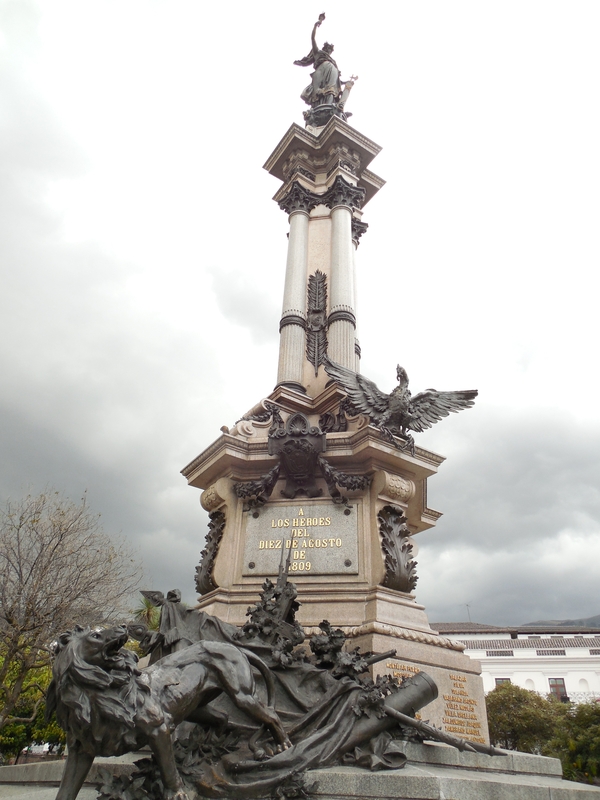 In the center of Quito’s Plaza Grande (or the Plaza de la Independencia) rises the Monumento a la Independencia. This work, known also as the Monumento a los Héroes del 10 de agosto de 1809, was designed and executed by J. B. Minghetti, Lorenzo Durini and Adriático Froli. The monument was inaugurated on the rebellion’s anniversary in 1906. The Monumento a la Independencia is rich in symbolism. On the east side, at the base, is a wounded lion (representing the defeated colonizer, Spain) and symbols of the Spanish monarchy: two flags, a cannon, three rifles and a cross. 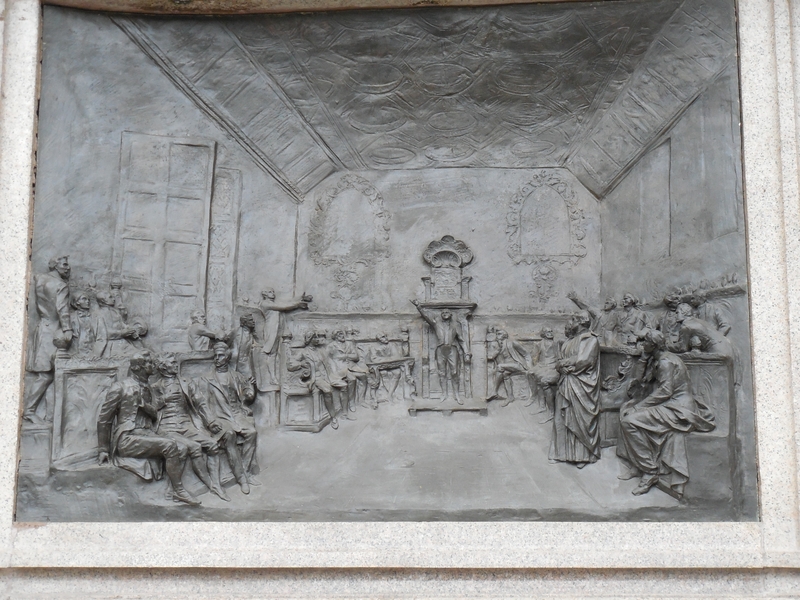 Above are four panels illustrating the events: the dedicatory of the monument (east), the scene of the congress at which Independence was declared (north) (the Congress was held in the monastery of San Agustín Church, located one block east of the Plaza), the text of the Declaration of Independence with names of the signatories (south, facing the Presidential Palace – Carondolet – and Pichincha, where the final battle of independence was won), and the massacre in the Cuartel de la Real Audiencia (south). The scene of the congress at which Quito’s independence was declared. The Congress was held in the monastery of San Agustín Church, located one block east of the Plaza. Above these panels is the condor, representing the Andean nations. It is breaking the chains of Spanish rules with its beak. The monument is crowned with the figure of Libertas, the Roman goddess of freedom. 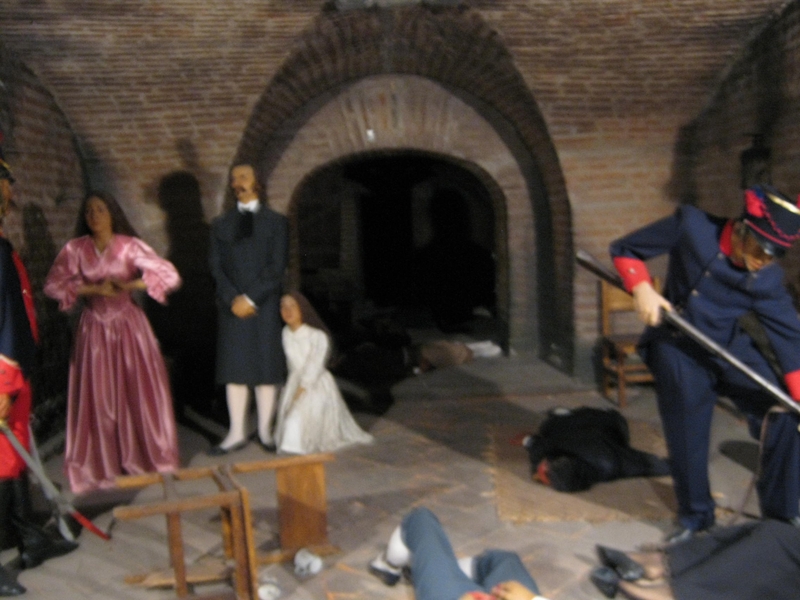 The scene of the massacre of the independence movement’s leaders in the Museo Alberto Mena Caamaño. 2 August 1810, a group of surviving rebels attacked the Cuartel de la Real Audiencia to liberate their imprisoned comrades. The royalist authorities responded by executing the prisoners. The Cuartel de la Real Audiencia is today home to the wax museum, Museo Alberto Mena Caamaño (Calle Espejo, between Calle García Moreno and Calle Benalcázar). In the vaults beneath the museum, at what was (it is said) the exact spot of the crime, the murder of independence leaders is shown. It is said that the guards at the Museo Alberto Mena Caamaño have eerie experiences at night. They see shadows and hear sounds like chains dragging across the flagstone floors. After the revolutionary leaders were killed, the fighting then took to the streets of Quito. At the orders of Conde Ruiz de Castilla y Arredondo, the Spanish royal governor, over 3,500 royal soldiers attacked and looted the neighborhoods of San Roque, San Blas and San Sebastián. Between 200 and 300 Quito citizens were massacred. A friend – a several-generation Quiteño who is a tour guide and amateur historian – says that when he was young, his family lived in the San Sebastián neighborhood. His cousins claimed they heard ghostly voices and screams during the night, around midnight. The mass grave of the massacre victims in Iglesia San Agustín. Iglesia San Agustín (Calle Guayaquil and Calle Chile) played an important role in both historical events surrounding Ecuador’s independence call. On 10 August 1809, the Congress at which the Declaration of Independence was discussed and signed was held in the Sala Capitular of the monastery of San Agustín Church. After the 2 August 1810 Quito massacre, townfolk gathered the bodies and brought them to the fathers here, for a Christian burial. The fathers of Iglesia San Agustín cleaned the bloody bodies of the massacre victims and interred them in the crypts beneath their monastery. The common grave in which they lie is beyond this wall. 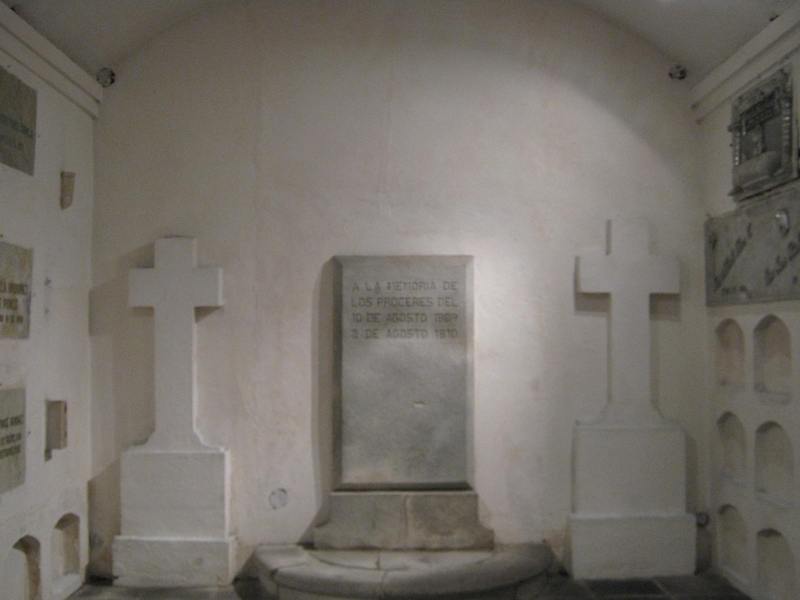 The crypt is open to the public only on 2 August of each year. A few of the revolution’s leaders who were slain in Cuartel are also here. 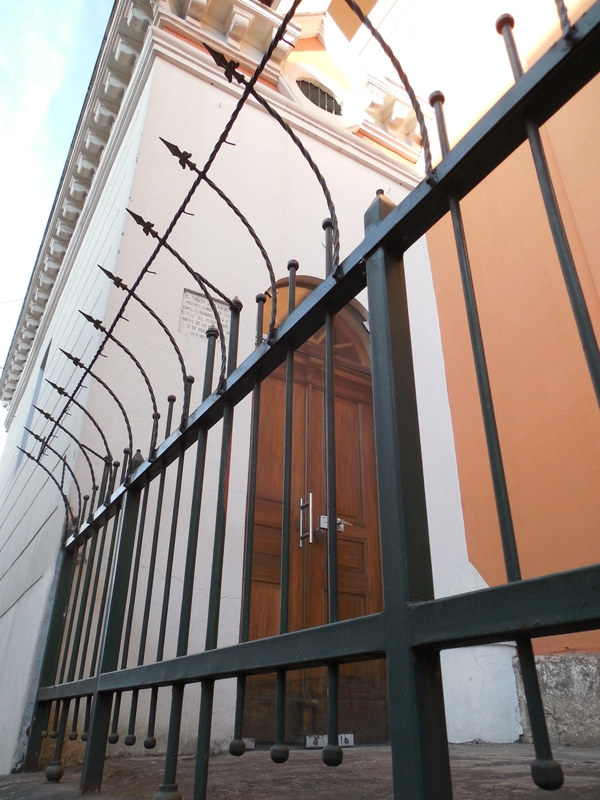 Others were buried in San Francisco, Santa Catalina and other churches in Quito’s Centro Histórico. Ascasubi Matheu’s chapel at Iglesia Santa Catalina. Not all of the founders of the nascent revolutionary movement died in the massacre, however. One – José Ascasubi Matheu – built a chapel at Iglesia Santa Catalina (Calle Espejo and Calle Flores), in thanks for having survived the massacre. The founder José Ascasubi Matheu built this chapel to Our Lady of the Rosary who saved him from the massacre of 2 August 1810. This entry was posted in History and tagged Ecuador, Independence, Quito. Bookmark the permalink. Sucre in Bolivia did the same thing on May 25, 1809. La Paz in Bolivia declared independence from Spain and the king on July 16, 1809. Thank you, Carlos, for stopping by. Indeed, you are correct — as I have discovered myself after writing this article. Every week, I research historical and other events for posts on my facebook author’s page (www.facebook.com/lorrainecaputo.wanderer). It was then that I learned that in both Bolivian cities, declaration was declared several months before it was in Quito. I have asked Ecuadorians about this, and why they lay claim to being the first city — only to be met with blank stares. Thank you for your contribution, and I hope you’ll continue to stop by this corner of cyberspace and teach us.